Here in the UK, Mother’s Day is Sunday 10 March 2013. Yes, that’s this Sunday. If you haven’t yet sorted yourself out and found a card and a top present for your mum, you are a horribly ungrateful child and I am totally judging you right now. Ha, not really! But I would say this: don’t panic. There is still time to shop for something good. In previous years, I have written about how moody I get when it comes to Mother’s Day flowers, because the mail order retailers and florists hike up the prices something stupid. I can’t bring myself to cough up £30+ for a few measly carnations. Fortunately, this year looks to be different. Interflora is doing a glass vase arrangement of freesias, germini, lilac, crysanthemums and a cream rose for £29.99. It’s not an amazing price, but to my mind, it’s a definite improvement on previous years’ offerings. 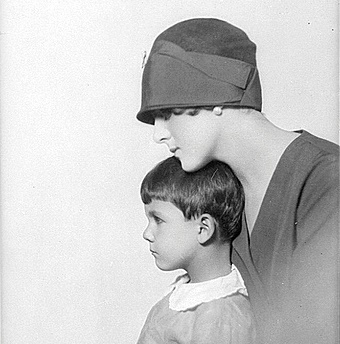 Also, the cut-off date for Mother’s Day deliveries isn’t until 5pm on Saturday 9 March, so perfect for the more harried and forgetful among you. Take a look here. Bunches.co.uk is always good for high quality flowers, speedy deliveries and reasonable prices. This year they are doing a Thank You Mum Gift: a box of chocolates along with a pink and purple bouquet for £19.99. For an extra £9 you can double the size of the bouquet. Find the deal here. The price includes delivery by Royal Mail First Class post, and more than 95% of Bunches deliveries arrive the next working day. Next-day delivery costs an additional £5.50. My favourite flowery pick, however, comes from Marks & Spencer. 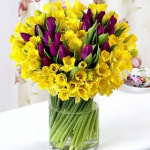 If your mum prefers armfuls of flowers to dainty posies, this one is for her: a giant bouquet of 100 daffodils and purple tulips (pictured) for £25. Order by 6pm on Friday 8 March for next-day delivery. Thorntons has some tasty Mother’s Day deals: you can buy one, get one free on its £9.99 Limited Edition Continental boxes (pictured). If you order by 6pm today (Thursday) you can also get 15% off with the code MDAY. The downside: for some reason Thorntons won’t deliver on Saturdays, so if you are shopping online, you have to order by 6pm today (Thursday) for next-day delivery in time for Mother’s Day. The upsides: the next-day delivery charge is now only £2.95. Also, if want to buy the chocs in person there are hundreds of Thorntons shops all over the UK. You can find your nearest one here. 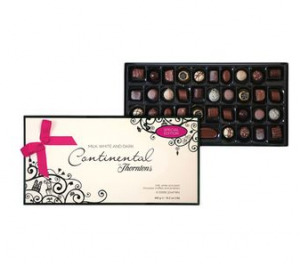 If you want to go posher: Hotel Chocolat is doing a special Mother’s Day box or truffles, pralines and caramels for £22. Order by 6pm for next working day delivery. To my mind, it’s difficult to get a good bargain with jewellery at the moment. Gold prices have gone through the roof, and silver is rising fast too. My mum loves gold jewellery so I saved up a crazy amount last year to buy her something special for her 60th birthday. When I went to the local jewellers and they showed me what I could get for it, I wanted to cry. 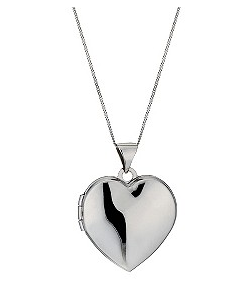 Anyway… Right now you can get up to 50% off H. Samuel jewellery. Next day delivery, which includes Saturdays, is £4.95. Debenhams is worth checking out: from now until Saturday, there is up to 25% off in every department. M&Co has a final clearance sale, with up to 70% off. 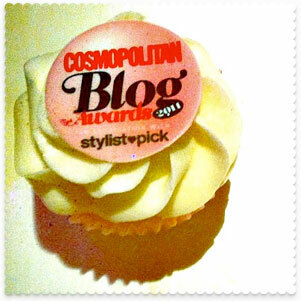 My fellow blogger Savvy Annie found Andrew Collinge products in Poundland this week. Boots is going all out for Mother’s Day. Their deals include half-price DKNY and Emporio Armani fragrance. 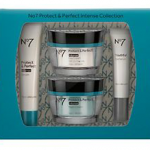 If your budget is higher, the Boots No7 Protect & Perfect Intense Collection (it’s anti-ageing stuff, which isn’t the most glamorous gift, but lots of mums seem to be obsessed with this range) has been reduced from £89.50 to £43. You can buy it in-store or get free next-day delivery on orders placed before 5pm. Image credit: Australian National Maritime Museum on The Commons. Great suggestions! Whether it is Mother’s or Father’s Day, you want to make them feel special and appreciated. The easy solution is buying gifts! I can’t think of anything more special then my children giving of themselves. It may may be their time or making something special for me. 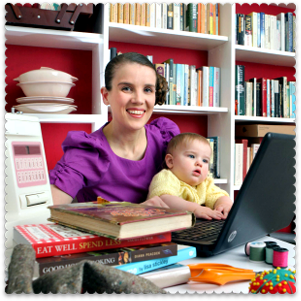 In the past, I particularly enjoy it when my children will make a breakfast or dinner for me and spend time with me. This is the way we spend those days with our children. I am on a tight budget this year, so I took advantage of an offer at Ambala Foods. If you spend £10, you get a free box of Turkish Delight if you enter the code ‘FREETD’. It says offer ends 11th March (these Asian sweets are heavenly! ).